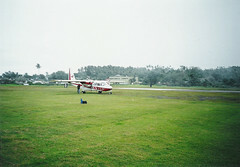 In February 2001, I was invited by the Flying Medical Samaritans for a missionary “field trip” to a couple of the islands they minister to and the orphanage they run. Gosh, where do I begin? So many stories to tell of that weekend. Saturday morning, we took off from Manila Airport on a Britten-Norman Islander (dual-engine turboprop) for an hour’s flight to Calapan Airstrip, Mindoro Island. (Mindoro’s pretty big; about half the size of Luzon.) After landing, it was another hour’s jeepney ride through some beautiful rice fields and hills, to the town of Naujan, home to the FMS Bahay Kalinga Orphanage and Day Care Center. The orphanage cares for unwanted or abandoned children from around the area, feeding, clothing, and sheltering them and making them available for adoption. At the kiddie care center, parents who can’t afford nursery or kindergarten for their kids bring them to Bahay Kalinga, where caregivers provide Christian-oriented activities for the children, and also minister and share the gospel with their parents. That’s where I met Maria. Maria is five years old, and has been blind since birth. When she came to the orphanage two years ago, she was blind and malnourished, unable to function on her own. If deprived of physical contact with another person for even a second, she would scream, and scream, and scream. She could not do anything without someone holding her at practically all times of the day or night. Today, she is a miracle in progress. She can now walk unaided, form words, and sing, and she is the cutest little bundle of joy you could ever hold in your arms. I don’t normally like kids, but to have Maria, giggling and swinging in my lap, was a blissful experience I’ll never forget. She hugs you by reaching up for your head and pulling, and she loves to be swung and tickled and sung to. Being blind, she needs constant non-visual stimuli to keep her mind working: music, touch, and motion. She’s hard to communicate with, because she’s still mostly dwelling in her own world — a coping mechanism because of the blindness. But she responds to love with love, and I can’t describe the joy in my heart at holding her, loving this child and feeling her love for me. But I have to admit, it got tiring. But then, kids are always tiring, special or not, so I can’t say I wasn’t thankful when one of the orphanage caregivers took charge of her and let me go. But to hear Maria sing gospel songs out loud to herself, to watch her play with Gerry, laughing and giggling, to hear her mouthing out her prayers before dinner; it was an experience that will stay in my heart always. 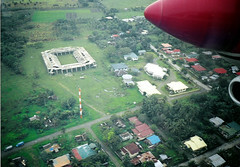 The next day, we flew from Calapan airstrip to Katakian (ka ta KYAN), a tiny little island to the east of Luzon, facing the Pacific Ocean. To get the weight on the plane evened out between the other missionaries, I got to sit in the copilot’s seat! Fun, Fun! It was an hour’s flight, with a strong headwind and lots of clouds and turbulence, but a great experience nonetheless, since I haven’t flown in a small plane since I was a baby, and I’ve always been a bit of an aviation enthusiast. Gerry and I talked about planes and flying and the ministry, while he showed me how he flies by instruments, and pointed out landmarks, islands, and airstrips we passed over. As we approached the tiny grass airstrip, a cow was grazing on the near end, blocking our landing; we flew in real low and buzzed it, so it ran off the airstrip in a panic. I had never seen a cow gallop like a horse until this morning. 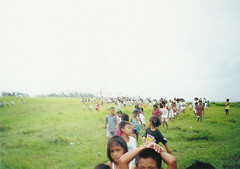 When we landed, a huge crowd of village children had gathered, and as we taxied in, they approached the plane curiously. You know how it gets on these missions. “Hi, hello, magandang umaga, kumusta na kayo!” But all the kids do is stare at you like you were aliens from another planet. Oh, well. We locked up the plane and got our stuff and hiked over rice fields, followed by a mob of children, down a muddy trail to the village. 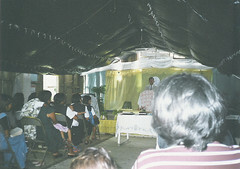 The FMS had a small church building in the center of the village for their worship services, with a parsonage right beside it, but a strong typhoon hit the Philippines last year, severely damaging the building roof and destroying the parsonage. Rebuilding is still underway. Still, they stretched and tied a plastic canvas out over where the roof used to be, and the damage didn’t stop us from having a great, spirit-filled worship service. The pastor, an islander himself, was very much in touch with the people, and we heard the testimonies of more new converts to the Christian faith. Over a hearty lunch of sea clams and fried fish, I learned that some of the men in the church had once been dynamite fishermen, but upon accepting Christ, they had stopped their destructive fishing practices and taken up seaweed farming: a very lucrative business in the right hands, and perfectly suited to those islands, where seaweed grows excellently. The problem is, the people who manage the seaweed farmers are abusive usurers. These managers require the farmers to buy (or loan) the harvesting equipment from them, rather than renting or supplying it as a manager should. Then, they buy the seaweed from the farmers at much lower prices (ostensibly to compensate for their equipment debts), then sell it at an unfairly large profit in mainland markets. Practices like this are widespread all over the country, not just in aquaculture, but in farming and other industries as well; most of these usurers are often employed in turn by rich businessmen or even government officers. It’s a vicious, abusive cycle of exploitation to line the pockets of the overpriveleged, at the expense of poverty-stricken workers who just don’t know any better. And speaking of lining pockets, one of the villagers approached us and asked, in halting, broken Taglish, for money. He claimed that his two daughters, both “newly baptized Christians,” were running for Councilor of that district, and they needed “campaign funds” to get the registered voters’ votes through special favors. In other words, buy votes. Bribe the villagers. We all know that’s how Philippine politics works, after all, but of course no missionary could possibly give even a centavo to something like that. I didn’t know what to say, and neither did the missionaries. (It had to be in Tagalog!) I prayed a bit, and I don’t know how I came up with this except through the Holy Spirit, but this is what I told him: “Hindi po talaga puwede, dahil hindi po kami sumusuporta sa ganoong klaseng pamumulitika. Dapat ay daanin iyan po sa mahusay na pagpaplano, mabuting pangako, at tamang ugali; hindi po sa pitaka at paglalagay.” Well, I think he got the message that we were saying No, shook hands with us, and walked off. When we hiked back to the plane, it was a beautiful view from the airfield. We climbed a hill to get there with a strong wind blowing, and as I came over the rise, I saw the airstrip, grass waving in the wind, the Islander there to one side of the runway, and a gorgeous view of the whitecapped Pacific Ocean. I felt wonderfully alive that moment, and I had to stop, breathe in the joy of God’s creation, and thank him for all this beauty. On the flight back to Manila, I got to sit in the copilot’s seat again! As we approached the airport, we flew right over my apartment, and I got a great view of the area all around the airport from an angle I’ve never seen in flight before; from the cockpit of a plane, no less! So we landed and got our stuff, and we got picked up from the hangar, and they dropped me off at home, and here I am now. I was truly blessed by this trip, and the fellowship and ministry was a great joy to me. Right now, there’s a small, pink tropical flower sticking out of my Bible; a welcome gift from the villagers of Katakian. There’s also a few banana leaves wrapped around some delicious sweet sticky rice in the fridge; baon from dessert at church. I thank the Lord for all He’s shown me this weekend. I’ve truly seen Him at work through these wonderful people. If any of you are interested in sharing, why don’t you check out their website, PMAFMS.org? There’s lots of opportunities for ministry, whether through missionary field work, donations in cash or kind, or simply praying for the work they do out there. They’re all important: those who work, those who give, and those who pray. God bless you all. Previous post: Flying to Mindoro. Now.